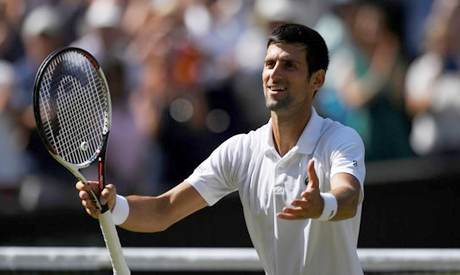 Three times Wimbledon champion Novak Djokovic was a man on a mission after the former world number one beat Japan's Kei Nishikori 6-3 3-6 6-2 6-2 on Wednesday to reach the semi-finals for the eighth time. "I feel like I'm peaking at the right moment," declared the 12th seeded Serb after joining Americans John McEnroe and Pete Sampras in fourth place on the list of most Wimbledon semi-final appearances in the Open Era. The 31-year-old will play either second-seeded Spaniard Rafael Nadal or fifth-seeded Argentine Juan Martin del Potro in the last four. Djokovic had looked in control after the first set on a sunny Centre Court but lost both his cool and concentration in the second after a heated exchange with umpire Carlos Ramos. With his 24th seeded opponent saving three break points to hold serve at 2-1, Djokovic bounced his racket off the baseline in frustration and then seethed after he was given a code of conduct warning. "You think I ruined the court for just throwing my racket (down)? Do you think that or not? Be honest." the Serb exclaimed, shaking his head. Nishikori promptly broke serve and then held to go 4-1 up before levelling the match at 1-1 but any sense of a fightback, and the possibility of a first Japanese man in the Wimbledon semi-finals since 1933, was short-lived. Nishikori, playing Djokovic on grass for the first time and seeking to end a 12-match losing streak against the Serb, held to 3-2 in the third set before running out of steam against an opponent in merciless form. With the Japanese serving to stay in the match, Djokovic wrapped things up after 2-1/2 hours on the first match point to secure his first Wimbledon semi-final since 2015. "I thought it was unnecessary to get the warning," Djokovic said as he came off court. "I didn't harm the grass, I know how I threw the racket. He even threw the racket in the fourth set and the umpire said he didn't see him so I get the warning, he doesn't," added the Serb. "So I think it's not fair but it is the way it is, in the mix of emotions and a tough match it happens." The semi-final will be the 32nd of Djokovic's Grand Slam career but he has had to fight to get there. Now ranked only 21st in the world, with his career stalling since his 12th Grand Slam title at the 2016 French Open, last year's Wimbledon saw him retire in the quarter-finals with a season-ending elbow injury. Asked whether he was a "man on a mission" to get back to where he left off, the Serb could only agree: "Of course, that's why I'm here," he said. "I've worked very hard and very smart to get myself in the best possible shape for the biggest events and it doesn't get any bigger than Wimbledon. So hopefully I can keep going."